For those who are unaware, AOR is being revitalized by a plethora of bands hailing from Scandinavia. Each album released seems to continually raise the bar of excellence, as the music is just so consistent and well crafted. Without exception, the debut from XorigiN upholds this notion. Equal parts Norway and Sweden, founding members Johannes Stole and Daniel Palmqvist are set to release their excellent debut with 'State Of The Art.' All fans of classic AOR (Styx, Don Henley, Bryan Adams, Diving For Pearls and Terry Brock all come to mind) will find much to enjoy on this recording from the label all have come to respect as the best in the Melodic Rock genre, Frontiers Records. Songs like 'Can't Keep Running,' 'Too Late,' 'Gina' and 'The One For Me' are all standouts and leaves us begging the question, "When can we expect album #2?" If there is any possible detriment, it is only due to the fact that 'State of the Art' is slated for release in August, competing with fellow label-mates, Work of Art and Toby Hitchcock, both of which are ready to uncork cracking albums of their own. However, if you can afford it, purchase all three of these albums because you will not be disappointed with any of them. 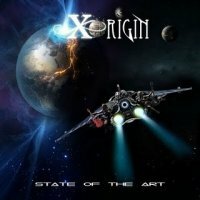 Although a few schooled acts by the likes of Whitesnake, Warrant and Night Ranger have all recently delivered great albums which deserve kudos, we cannot ignore the new acts that are delivering albums of exceptional quality and deserve to have their brand of Melodic Rock/AOR heard, and XorigiN is no exception. I think it is time for Frontiers to think about organizing a showcase tour which encompasses the lesser known artists with a more senior act to attract would be concert-goers. Until then, I highly recommend the debut from XorigiN. This is yet another winner and one that I'm sure you will revisit again and again.